Extend your voice with Amplivox portable sounds systems. Amplivox mity-meg 602R series. Extend your voice in large, open spaces with the Amplivox mity meg megapgone. It's ideal for crowd control, announcements and noisy environments, or emergency servies. Mity meg's 25 watt power lets you reach even far away audiences. Use mity meg not only to talk, but sound emergency signals. Mity meis powered by either conventional batteries or a rechargeable lithium ion battery that can be reused hundreds of times. A battery strength indicator shows you when it's time to chrage or replace batteries. You can switch battery types any time so you're never out of power. And there's an optional carry bag that protects the unit. Use the AmpliVox 602R mity meg megaphone to extend your voice in large or loud crowds! The WNA Comet gala holdaplate is an innovative cocktail plate that allows your guests to hold both their beverage and plate in one hand! 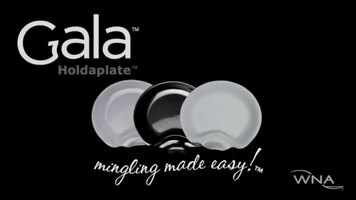 This plate is perfect for parties, galas, and other special events. 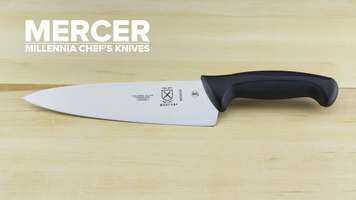 Every professional chef needs a chef knife, and these Mercer Millennia chef knives are perfect for fulfilling that need! Available in several sizes and styles, these chef knives come ready to slice, dice, cut, mince, and more. Learn more here!